I won the most FABULOUS giveaway over at Kaari's blog. A box full of slugs. Hi Suzy – congrats. on your win! Hope you enjoyed your Valentine’s Day celebration, and that your were spoiled rotten! Well this is great news that you will be in town with Beth on 2/28. I’ve marked my calendar and, providing nothing unforeseen happens, I’ll catch up with you at SuzAnna’s around noon that day. I was just over there this afternoon and Jenny and I were chatting about you coming by. I was naughty, bought a few things I needed for the dining room/entry make overs – but am thrilled with them. Always nice to be a winner. And hope you had a lovely Valentines Day. How cute! I love seeing something so imaginative! Ooooh, so adorable!! Lucky girl! Aren’t they wonderful! I was admiring them on her website, and it’s nice to know they’ve gone to a good home. 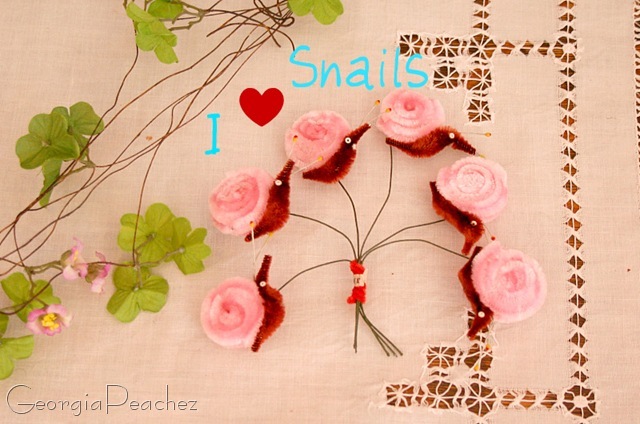 Adorable fluffy snails! So cute. Too cute…personally, I like my snails served with garlic butter sauce (lol). Hope you enjoyed Valentines day. Yours are the first slugs I’ve come across that I actually wouldn’t mind having around! And they’re fuzzy and not slimy…even better! !